The QuickontheNet.com site-builder system is very flexible and easy to use. For example, you can consider using this template if you are letting villas in Mediterranean Europe, or buy this template if you wish to rent out your vacation condo in another part of the world. Create a home page to highlight your key selling points. Embed videos in a video gallery. Add a clickable Google Map. Online contact form for general enquiries. Booking request form for new customer bookings. Create a web page to display your rental costs. Take customer credit/debit card payments from your own customers, via PayPal. Present your terms of business and cancellation policy. Add guest comments from previous lettings. Add information and links about local attractions and services. Add hyperlinks to help your customers plan a holiday. Email a link page with an automatic link back to your site. 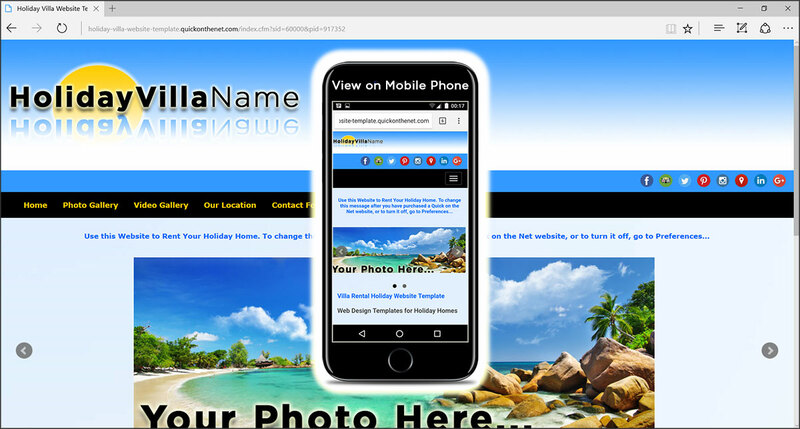 As standard, the web pages above are provided, but you can add or remove web pages and rename the menu buttons, according to your needs.